Visiting Slovakia in autumn and not experiencing a traditional goose dinner is like not being here at all. Explore the unofficial capital of goose festivities and visit a family business Husacina pri mlyne run by a mom and a daughter. You will experience professional and cordial approach and taste a properly roasted goose based on a recipe passed on from generation to generation. 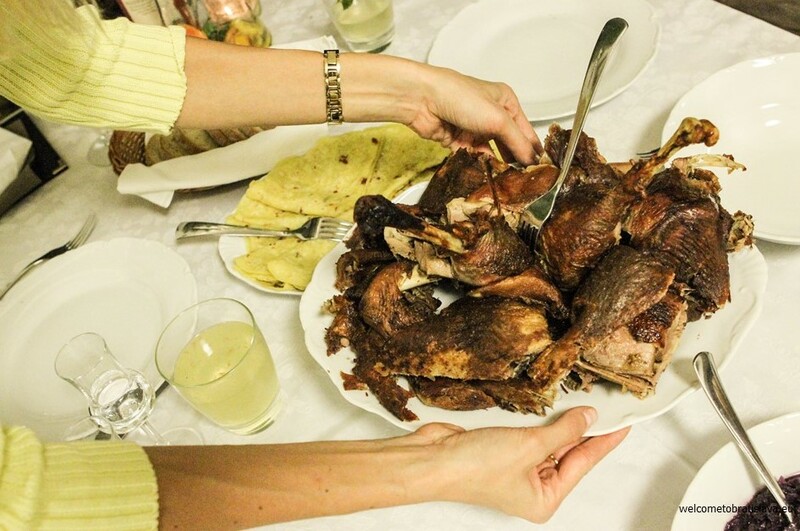 If you are visiting Slovakia and would like to have a proper local experience outside of Bratislava, trying a roasted goose is just the RIGHT thing to do. We have written in detail about the goose and duck festivities in Slovakia here. Basically, only a few kilometres from Bratislava, there is a village Slovensky Grob in the Pezinok district that is famous for being the unofficial capital of goose festivities. 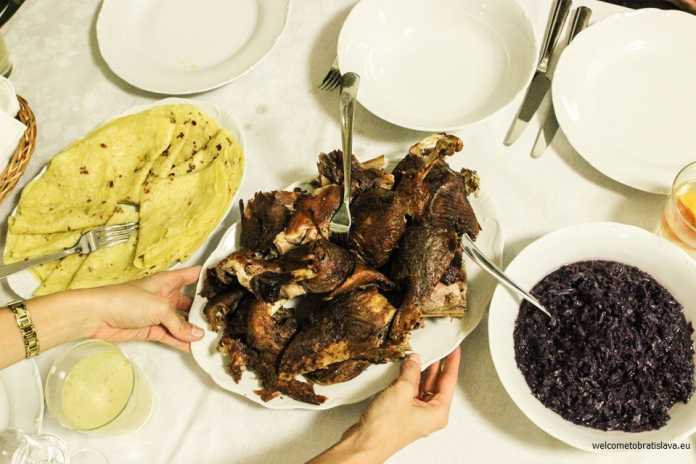 The roasted goose meat goes hand in hand with the wine festivals (vinobranie) that are associated with the period between harvesting the fields and autumn planting. The goose goes together well with young wine (burčiak), which used to be produced in Slovensky Grob. The vineyards do not exist in the village anymore but the goose tradition survived. 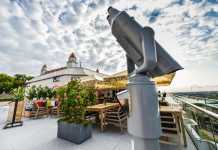 Nowadays it is paired with the wines from the nearby towns and villages. The tradition goes back in the past when, at the time of the economic crisis, farmer housewives started to sell these delicious birds already roasted and not only as raw meat. At first, they travelled to local markets around the village to offer their goods. However, customers wanted to have the meat fresh and warm and were willing to travel to the village itself to get it. As the local joke goes around, children were waiting at the entrance to the village and luring the visitors with words: “Come, my mom has a juicy one” (referring to the goose of course :D). This time, we tested one of the goose restaurants, set in a beautiful garden and run by a mother and a daughter who have learned the craft of goose roasting from their great-grandmother. 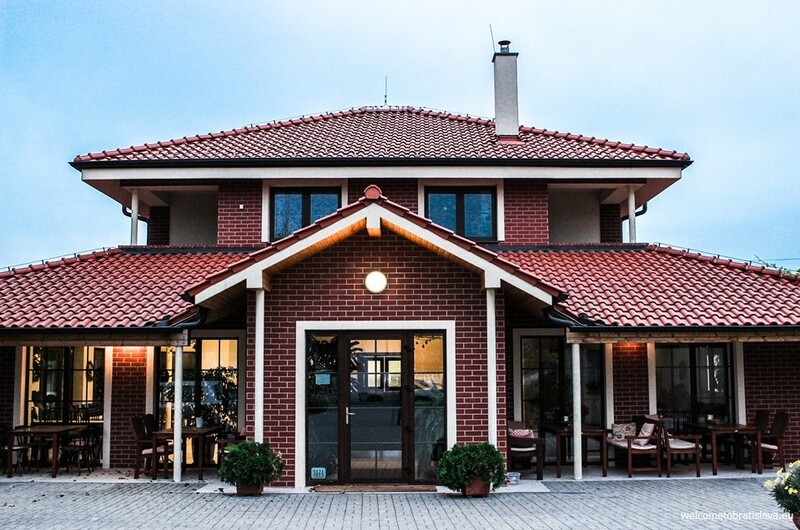 Slovensky Grob is located only a 30-minute drive from Bratislava. The most convenient way is to have a designated driver, so you can enjoy the local wines or even something stronger, typically paired with the goose. Husacina pri Mlyne stands at the beginning of the village, on the main road and therefore is easy to find. Look for the Mediterranean styled villa in a courtyard behind a wooden gate. Husacina pri Mlyne has a refreshing design. Since almost every second house in the village has been transformed into a restaurant, you can see mostly very traditional (almost historical) interiors or dungeon-like looking underground cellars. Husacina pri Mlyne decided to be different, which we always enjoy. 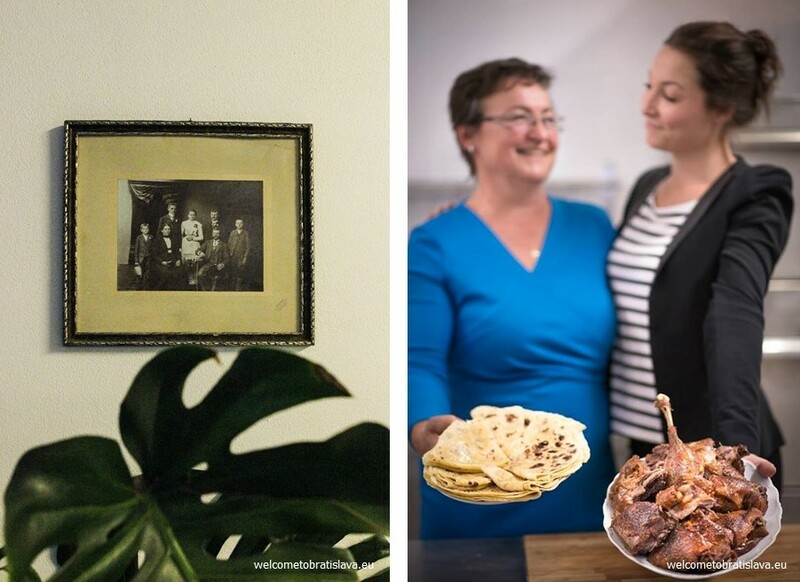 We applaud the owners who smartly connected two of their family traditions – the fact that they have roots in Croatia and transferring this into the Mediterranean premises, and serving Slovak specialties based on the recipes of their great-grandmother. The house is located in a beautiful, spacious and well kept garden. A big plus is a huge trampoline, perfect if you’re coming with your kids (moreover, there is a well-equipped kids corner inside, too). Numerous grand windows ensure plenty of sunlight during the day and allow us to breathe in this space. As we walk inside, we feel completely at ease here. The colors and the style are in line with what makes us feel relaxed. The premises consist of two main rooms. Our favorite element is the fireplace, literally creating the effect of warmth. White walls and simple dark wooden furniture make the exquisite food pop up without stealing the spotlight. The minimalist decorations in the form of vines refer to the wine-making tradition and the regularly changing pictures hanging on the walls are always created by the local artists. 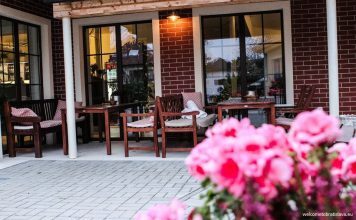 Husacina pri Mlyne is a family business run by mom Margita and daughter Katka and this is definitely reflected in the approach how they treat their customers – the service is exceptional here and their professionalism and cordiality make us want to keep returning here. Katka even speaks English which makes the visit enjoyable for foreign customers, too. 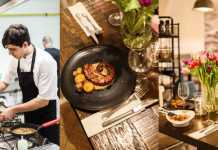 The restaurant itself has been open only for a few years, compared to other places in Slovensky Grob, but is built on a long lasting family tradition. Their great-grandmother was the last miller in the village and a well-known cook. She passed her knowledge of cooking on to her children. Each family had their “own best way” how to prepare the goose, which was passed on from one generation to the next. The name “Pri mlyne”, by the way, relates to the fact that in this area, one of the village’s mills used to stand (“pri mlyne” literally translates as “by the mill”). 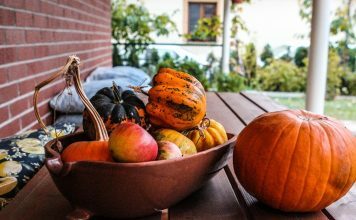 Another important piece of advice – even if the goose is most traditional during the period from September to December, the restaurants in Slovensky Grob serve them all year long. If you are visiting Slovakia in spring or summer, you can still try this traditional delicacy! We started our dinner with an amazing homemade goose soup with special thick homemade pasta. This type of pasta is traditional for the village of Slovensky Grob. We’ve got some homegrown chili peppers to spice it up. 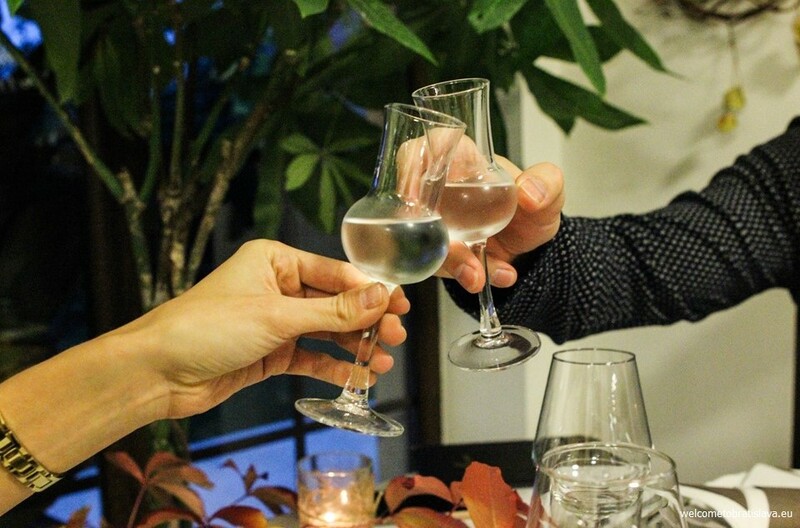 We did not resist clinking with a pear spirit “hruška” – very strong yet delectable. It helps to digest the hoards of food that are coming. The second course was our all time favourite – salty goose liver served with bread and homemade pickled peppers and cucumbers. 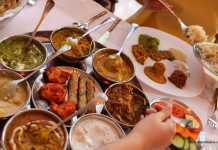 Our tip – if you do not like liver (which is our case) but you have never tried this way of serving, definitely go for it! Normally, we aren’t very fond of liver but can’t resist it when it is prepared this way. The main course is a whole roasted goose served with salty potato pancakes (lokše) and cooked red cabbage. Mrs. Margita’s recipe is the best – the goose was not dry at all but juicy and tender, with the crunchy top skin. The pancakes are made in the village, too, and always picked up freshly before the scheduled dinner (which we could really tell). 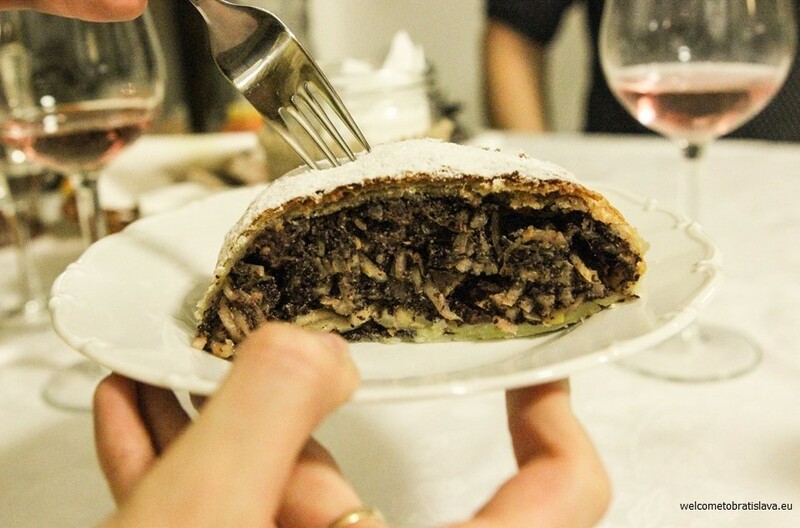 A popular apple-cherry-poppy seed strudel was not missing as a perfect finish of a lovely evening. Dobrú chuť!